Versele-Laga is an international manufacturer of quality food and other care products for all kinds of performance animals. At Pets World, we stock their products and help you buy it online easily. There is an extensive range of products to choose from, so there is something at Versele-Laga for everyone. The company gives immense importance to quality control and carries out extensive quality checks on ingredients before declaring them fit for production. All the seeds and grains are tested before being approved to be used in the manufacturing process. At Pets World, you can find products for all kinds of animals like cats, dogs, rodents, rabbits, guinea pigs, squirrels, rats, mice, chinchillas, hamsters, gerbils, poultry, or herd. They also have different types of products for various birds, like pigeons and parrots. There are products like cat litter and dog litter deodorizer in our online assortment. They provide food with optimum nutrients for all kinds of animals. Their food is digestion-balanced, active all-balanced and light-balanced, according to the need of your pet. These products don’t contain gluten and have added taurine to support heart function. Versele-Laga provides dietary supplements for all these animal species and make products to meet their specific necessities and requirements. They also provide products like bedding, kitty litter tray and roughage apart from food products. 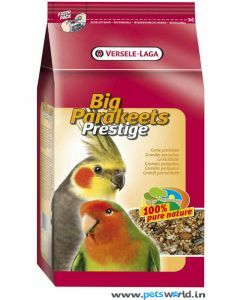 Here, at Pets World, you can find all kinds of products manufactured and distributed by Versele-Laga. You get a wide range of selection of products to choose and buy from. There is a different kind of product for a different species of animal. Also, the products are categorized according to the age, performance and breed of your pet. Check out our online store for all products under one roof. This means that you don’t have to go anywhere else to get what you need for your pet, be it food, supplements, grooming products, pharmaceutical products, or accessories.